Mitt There are 14 products. Mitt 16x21 cm 100% combed cotton 530 gr/m². Soft mitt, soft and with very good absorption. 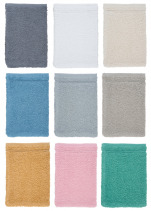 Colors: white, chalk, beige, brown, pink, gray, black, sky blue, ocean, navy, turquoise, coral, mandarin orange, red, emerald green. Wash glove 100% terry combed cotton from Egypt, 660 gr/m², +/- 15x22 cm. 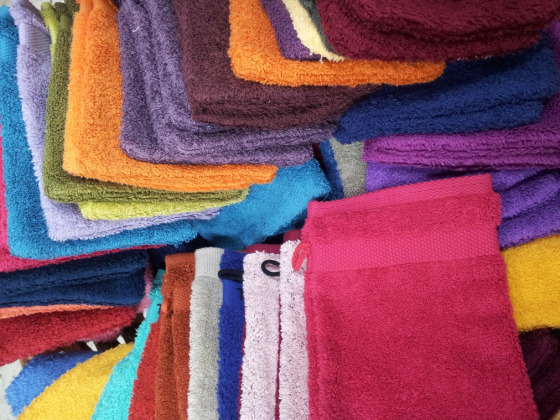 Soft and absorbent washcloth. Available in 20 colors. Washcloth 16x22cm 100% cotton terry multicolored lines green, fushia pink, orange, blue, green, mauve, burgundy and turquoise double sided. 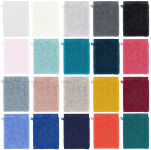 Washcloth 16x22cm 100% cotton terry multicolored lines grey double sided. 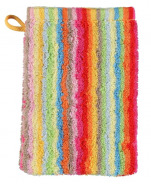 Washcloth 16x22cm 100% cotton terry multicolored lines, double sided. 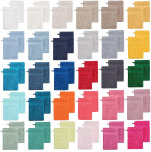 Washcloth Super 16x22 cm 100% combed cotton glove with long fibers, 700 gr/m², very soft, very high capacity of absoption thanks to double twisted cotton. Machine washable at 60°C. Wash glove 15x22 cm 100% pure combed towelling cotton 560gr/m². Available in 30 colors. Mitt Tintin and Snowy, 100% combed cotton, 500 gr/m², coloured stripe matched with the washcloth and black inscription "Tintin et Milou" woven jacquard. 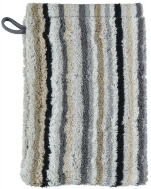 Washcloth 14x21 cm Nik 100% cotton with multicolored stripes: green, black, white, purple, gray and ice blue. 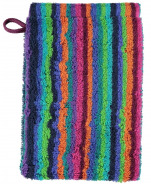 Washcloth 14x21 cm Nik 100% cotton with multicolored stripes: pink, black, ivory, white, black, brown and purple. Mitt 15x22 cm Andorre 100% cotton, fuschia fantasies with 4 lines of red, black, pink and white.